Located a half mile from the Miami International Airport, this hotel offers a complimentary shuttle 24-hours a day. This hotel overlooking Biscayne Bay is across from Bayside Marketplace, featuring over 100 stores and restaurants. Formerly a Doubletree, this hotel features views of the bay, a heated outdoor pool and a cafe that's open for breakfast. Enjoy direct beach access at this oceanfront hotel in Miami's historic Art Déco District. This hotel was honored with the 2008 Best of Miami award in the lodging category by the U.S. Local Business Association. This waterfront luxury full-service condo-hotel on Biscayne Bay is in the heart of downtown Miami. On-site restaurant Tony Chan's Waterclub received the National Top 20 Restaurants award by a Zagat consumer survey. This hotel offers free parking and a complimentary shuttle to drive you anywhere within a 3-mile radius. 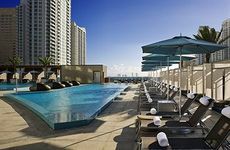 Only 10 miles from downtown Miami, this hotel offers a full-service restaurant and an airport shuttle. This hotel, just minutes from Miami International Airport and Port of Miami, offers free continental breakfast daily. This extended-stay hotel with studios and one bedroom suites offers a daily full breakfast buffet. Part of the Venezualan series of hotels, some rooms offer Jacuzzis. This hotel features the Great American Grill restaurant, serving breakfast, lunch, dinner, and evening room service. The suites at this hotel feature fully equipped kitchens with full-size refrigerators, microwaves, 2-burner stoves.